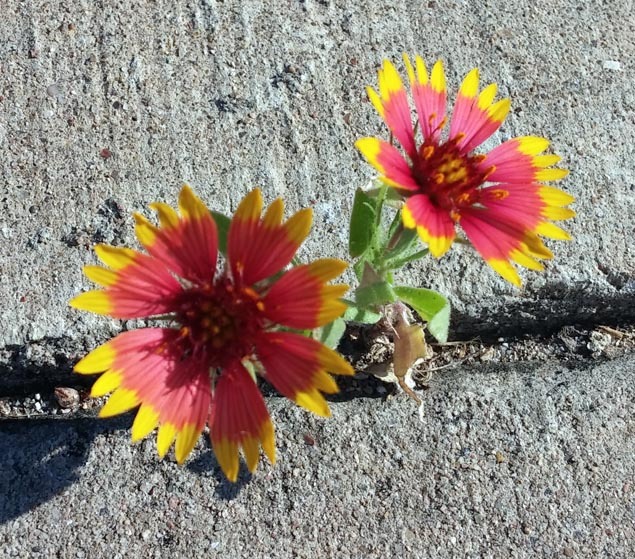 Its brilliant color caught my eye but what held my attention was where it was growing: in a crack in the sidewalk next to a busy road. I’ve always heard that a weed is a flower that happens to be growing in the wrong place. If we call this little plant a weed, then we want to pull it up and throw it away. If we call it a flower, we want to water it and watch it grow. 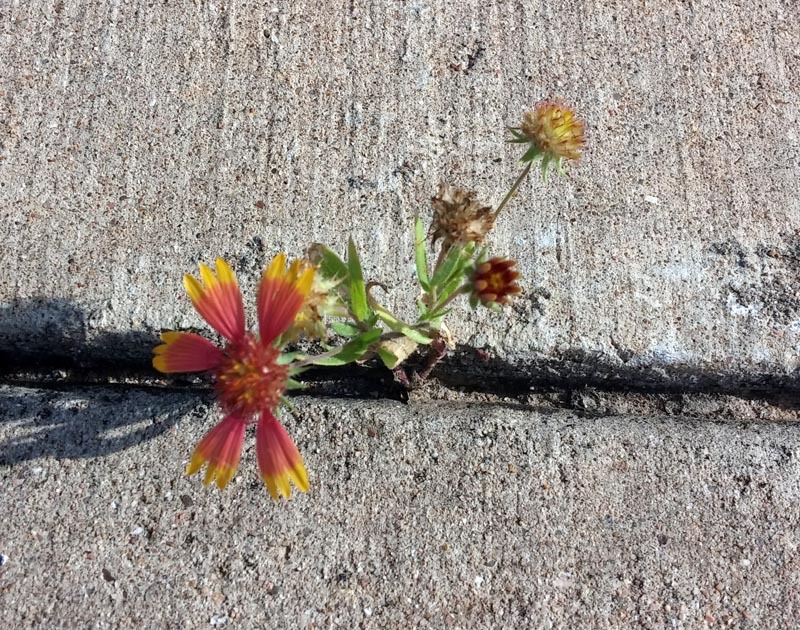 What we call this little plant matters; weed or flower — our words reveal our thoughts and therefore direct our actions. Our words have power. Without realizing it, we might be sabotaging our contentment with our words. A habit of complaining, grumbling, or murmuring, makes it very difficult to learn contentment. Could this be why contentment is beyond your reach, and mine? It is true that it is out of the overflow of the heart that the mouth speaks therefore it would do us well to listen to our words. Complaining reveals discontent and discontent is rebellion against God. Our words foster that rebellion or quell it. It is good to take our worries, pain, frustration, fear, or anxiety to God, but when we do, we must leave it with him, and accept whatever he decides to do about it. If, after laying our hearts before God, we decide that we don’t like his response and we complain, we are in rebellion. This doesn’t mean that we should just pull ourselves up by our bootstraps, put a lid on our emotions and stoically plod through life. When we do that, we are not being silent; our arrogant hearts are defiantly shouting at God. Our grumbling words can also lead us down wrong theological paths. When we habitually complain about our circumstances, we tend to forget that God is not about changing circumstances for our comfort, he is about changing our hearts through our circumstances. We must remember that we will not find contentment if our circumstances change, we will only find contentment in our circumstances when our hearts change. Pride, envy, covetousness, jealousy, distrust, unthankfulness … these things cause us to complain, and all these are rooted in unbelief. We also complain because we think we’ve done way more for God than he has done for us. How dare we think this way? Our words not only disquiet our own spirits, but the spirits of those around us. Our words can breed quarrels and discord in our families. Our words train our children to complain. It causes uneasiness at church and at work. Complaining words eat the sweetness out of life and people no longer want to be around us. When our words are heavily laden with sour grapes it doesn’t ease our burden, it makes our burden heavier. We forget that God is at work in our circumstances and we push him away rather than drawing nearer to him. So how do we stop the flow of complaining words? When we see God’s involvement in our lives as a good thing and are thankful for it. That you have suffering or affliction means God is at work refining you. That you have difficult circumstances means God wants you to lean on him – he is there! That you have heartache means God desires to comfort you, and use you to comfort others. That you mourn the death of loved ones means God has given you people to love. God is involved in your life for your good and his glory. “‘Our Father in heaven, hallowed be your name, your kingdom come, your will be done, on earth as it is in heaven. Give us today our daily bread. And forgive us our debts, as we also have forgiven our debtors. And lead us not into temptation, but deliver us from the evil one.’” – Matthew 6:9-13 NIV. When we ask God to give us our daily bread, we cannot complain about the kind of bread he gives. When we ask God to do his will on earth, we cannot complain about the way he works in our lives. When we ask God to forgive us – and he does – there is no room for complaining. We stop complaining when we take control of our thoughts, and then let those thoughts permeate our words. The little flower had a difficult place to grow, but it had a place to grow. God is using it and it continues to bloom, nineteen days later! What do you complain about most? Do you believe that God is using that circumstance for your good and his glory? How do your words reveal your trust in God, and your love for him? Enjoying all the messages Marcia. Thanks so much for this powerful message. It will certainly help me examine my heart and determine how any lack of contentment can be a call to learn to trust God in any circumstance! 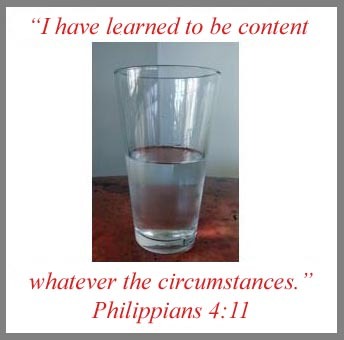 It isn’t easy writing about contentment! Seems that the adage, “the one who teaches always learns the most” is especially true here LOL. Thank you for your encouragement.